FOR a youth of such studious habits and indefatigable industry, no situation could have been more appropriate than that in which he was now placed. Benedict Biscop, the founder of the monasteries, was a man of extraordinary learning and singular piety. Though a nobleman by birth, he was unwearied in the pursuit of knowledge, and in ameliorating the condition of his country. In order to accomplish his benevolent intentions, he travelled into other countries, and introduced not only foreign literature, but arts hitherto unknown, into our island. He was the first who brought masons and glaziers home with him, having need of their services in the noble buildings which he erected. He travelled four or five times to Rome, and became intimate with Pope Agatho. Here he was much captivated with the Liturgy of the Roman Church, and their manner of chaunting, for until then the Gallican or Mozarabic Liturgy was used both in Britain and Ireland, as is alluded to in Augustine’s Questions to Pope Gregory. Each time, on his return to England, Benedict carried back with him the most valuable books, and costly relics and works of art which could be procured for money. This collection, which was, by his orders, preserved with peculiar care, received considerable augmentations from the zeal and munificence of his successors. Bede’s thirst for study was here, no doubt, satisfied: so large and valuable a library could scarcely have been within his reach elsewhere, even among the other Benedictines of the day, however well qualified that order may be to encourage a taste for learning, and to provide means for gratifying that taste among its fosterlings. In so large a community, too, as that of Weremouth, there were doubtlessly many scholars of mature age who would all assist in promoting the studies of so talented a youth as he who was now introduced within their walls. Bede was not, however, left to chance, or the untutored dictates of his own youthful fancy, to find his way as he could through the years spent in the rudiments of learning. In the study of Theology and the Holy Scriptures, he received, as he himself tells us, the instructions of Trumbert, a monk, who had been educated under the holy Ceadda, Bishop of Lichfield. The art of chaunting, as it was practised at Rome, was taught him by John, the Archchaunter of St. Peter’s at Rome, who had been, by the consent of Pope Agatho, brought into Britain by Biscop Benedict. This celebrated singer attracted multitudes of people from the countries adjoining to the monastery of Weremouth to witness his performances. It has also been said by Stubbs, that Bede received instructions from John of Beverley, the disciple of Archbishop Theodore; and possibly this may have been the case, as he might also from others learned in the Greek and Latin tongue who were in the company of that famous Archbishop; but Mabillon thinks that the author above referred to has made a confusion between the two Johns, for there is no other mention whatever made of his being a pupil of John of Beverley. 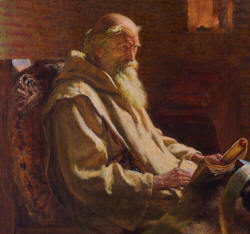 It is certain, however, that Bede possessed considerable knowledge, not only in the Latin and Greek languages, but also in the Hebrew, although nothing remains which has been ascribed to him in that language, save a vocabulary entitled “Interpretatio nominum Hebraicorum,” which, however, is the production of another. In the Greek tongue he must have made considerable proficiency, as appears from his “Ars Metrica,” and from his having translated the life of Anastasius and the Gospel of St. John out of that language into Latin. The last two of these productions are no longer extant.